Discover another side of Phuket by joining this culturally-immersive half day tour, exploring the fascinating old town and beyond, getting a taste of local life and a new perspective of this lovely island. Take a break from the beach for a culturally rich experience cycling through old Phuket town. Located on trading routes between India and China, Phuket became a melting pot of people, cultures and religions. The 19th-century tin boom attracted an influx of Chinese laborers and their influences are still evident in the architecture, food, and places of worship seen today. On bikes, you will travel back in time to unlock the secrets of Phuket Old Town and also explore the town's peripheral. Get set for a fantastic exploration of vibrantly beautiful Vietnam on a 14 day coastal journey, cycling from Saigon through stunning scenery up to the country's capital of Hanoi. Capture the essence of Vietnam on a comprehensive discovery tour over the course of a glorious two-week cycling adventure. Starting in the south from the buzzing city of Saigon (Ho Chi Minh City), you'll head north up the beautiful coastline of the country, arriving in the ancient capital city of Hanoi a fortnight later. Along the way, you'll encounter diverse and superb scenery, from towering mountains to lush rice fields and idyllic beaches. You'll experience warm hospitality and friendly smiles from the locals, be enchanted and enjoyably fulfilled by the culinary delights on offer, and experience an authentic and charming country that will surely leave a lasting impression. Experience the best of Hawke’s Bay on a three-day bicycle jolly that will dazzle your senses and leave a piece of your heart in this charming region. A natural wonderland, this moderately paced tour will take you through a wildlife sanctuary and wetland, whilst routing through estuary trail landscapes, riverside tracks, surf beaches and the fantastic cape coast. Of course, you will have plentiful opportunities to visit the famed vineyards that proliferate the countryside; as you ride through the scenic flatlands you’ll find pure relaxation in these spectacular surroundings. Join this small group, fully guided cycling tour on the iconic Murray to Mountains Rail Trail. This exclusive cycling tour is an all inclusive, small group weekend, complete with meals, accommodation, local guide, special wine tastings, gourmet food, luggage transfers and transport. Group tours depart on selected weekends from October to May and do book out well in advance. Take the stress out of your weekend away and enjoy this wonderfully easy cycling escape in the gourmet North East Victoria region, along the famous Murray to Mountains Rail Trail. With more than 150 years of winemaking history, the Clare Valley is one of Australia’s oldest wine regions. Enjoy cycling the off-road, safe and relatively flat Riesling Rail Trail and have all the logistics done for you, whilst you visit some of the best cellar doors and food outlets in Australia. 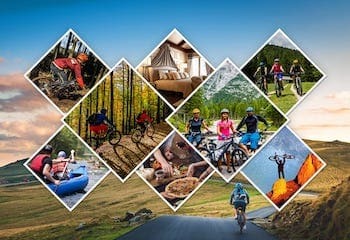 This self guided 3 day/2 night tour gives you the flexibility of choosing your own dates and cycling the Riesling Rail Trail at your own pace. As the name suggests, this cycling tour of the Great Taste Trail is a journey into food and wine country on the south island of New Zealand. Starting and ending in the scenic, seaside town of Nelson, this tour will delight the senses with the array of wonderful local produce, including some incredible wines! This is a fully guided tour, and you will be looked after from start to finish. Quality accommodation, gourmet meals, all winery visits, transport and a guide are all included. Sit back, cycle a little and enjoy all the best of this beautiful and stunning region of New Zealand.